You could say Gili Trawangan has a bit of a split personality. Half the island is grungey and action-packed, suited to backpackers of the night owl variety. The other, a much more private, secluded setup, suited to someone who needs to be spoilt and spaed. Whether you’re swinging from a hut with a hammock to a cheap warung, or looking to be pampered and put up in a villa with a view, Trawangan will deliver. 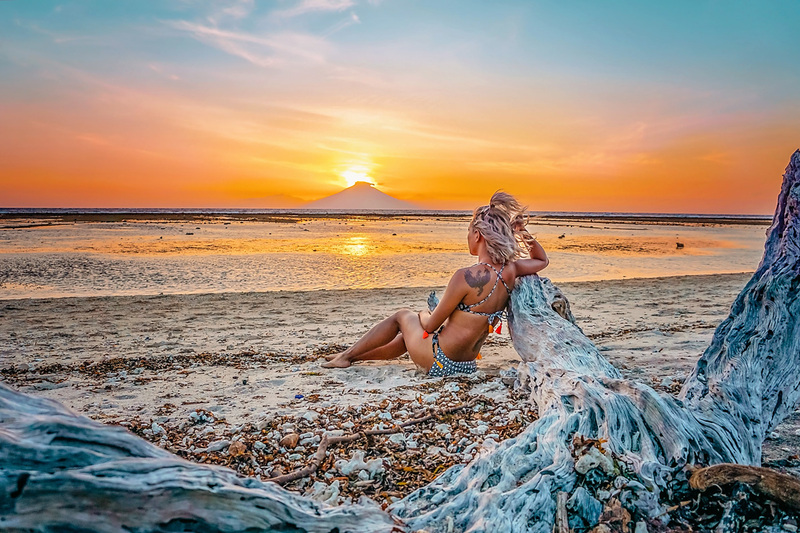 Yes Gili T is infamous for it’s nightlife with a bar to suit every style of party, but its lesser known ecletic night markets, elegant coffee shops and extraordinary underwater ecology with biorock snorkelling hotspots, are equally as epic. Insider Info: The name “Trawangan” originated from the Indonesian word Terowongan meaning “tunnel” as there are a series of tunnels throughout the island that were constructed by the Japanese during WWII. It wasn’t that long ago that we were all sleeping in basic borugas on the beach. Accommodation on Gili Trawangan has definitely come a long way since then. From hostels to homestays to hotels, all three islands have a huge variety of places to stay. And of course the beach borugas will always be an option! 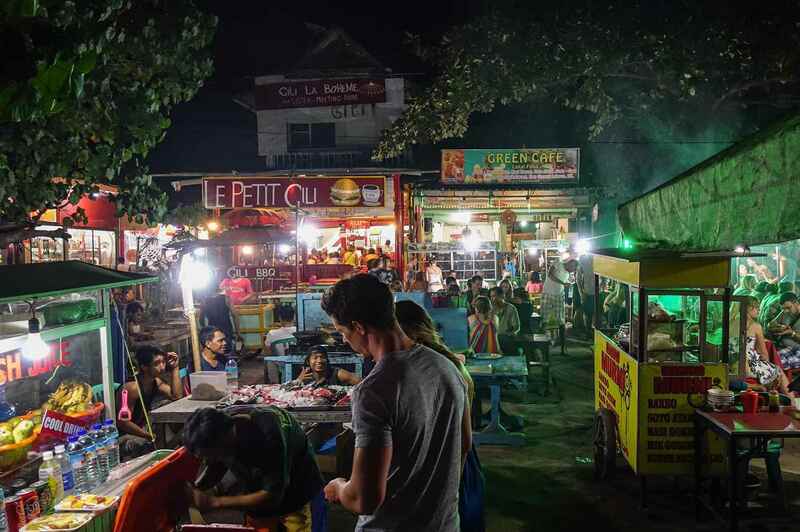 From the north, east, south and of course west, Gili Trawangan offers up a huge variety of feeds. Enjoy a cheap street-side nasi campur or beach-side seafood platter. Imported coffee or exported beer. Exotic night market or classic pizza joint. Gili T has got your dietry requirements covered. All dive sites around the Gili Islands are coral fringed and teeming with an impressive array of marine life ranging from “guaranteed” turtle sightings on every dive to black & white tip reef sharks and the occasional whale shark, manta ray and even mola mola passing by. Learn to become a breath-hold diver. Whether you’re a beginner or a more experienced freediver, the range of courses on Gili Trawangan will train you to be more efficient with oxygen and provide you with the skills necessary to have you diving to depths of up to 20m in no time. For some, Apnea may be about diving deep and conquering inner fears while for others it’s a way to peacefully interact with the underwater world. Gili Trawangan has several amazing snorkel sites around the island. Masks & fins are abundantly available for rent at several kiosks, dive shops and resorts. Please bear in mind that the currents can get a little strong at full and new moon and it is not advisable to attempt swimming between the islands. You can also book snorkeling trips around the 3 Gilis, Gili Air, Gili Meno & Gili Trawangan. Gili Trawangan is a great place for all kinds of watersports, from water skiing & wakeboarding to SUP stand up paddle boarding and the newest fun water activity Subwing. 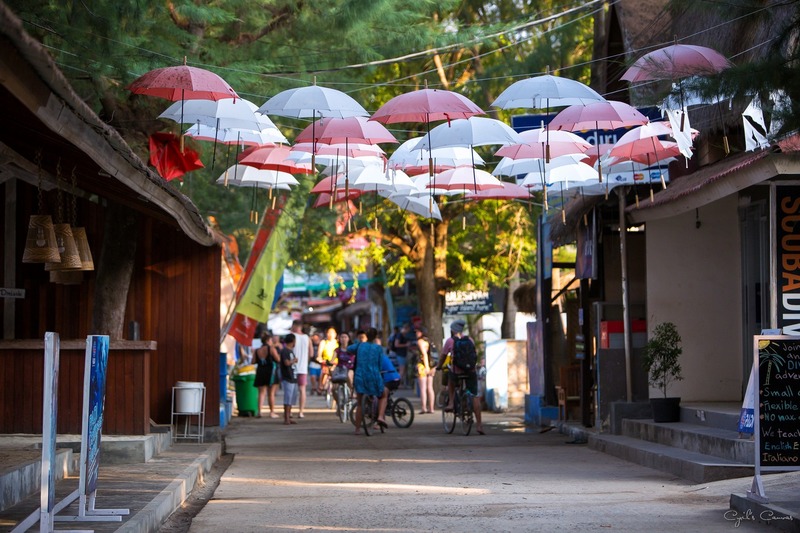 Gili Trawangan really comes to life when the sun goes down. The east coast is the liveliest part of the island with several bars and restaurants serving up some form of entertainment. Whether you’re into reggae, rock and roll, techno or jazz, there is something for everyone. Bear in mind that during the month of Ramadan (July) the party scene is a little more toned down Follow us on facebookfor the latest updates on what’s going on. Several resorts and villas offer massages but you can also find salons dedicated to a wide range of “urut”, traditional massages and other treatments. You can cycle around Gili Trawangan in less than an hour for a healthy workout or cycle at your own leisurely pace and really get to know the island. Don’t forget to bring water and your snorkel equipment. Enjoy a beautiful panoramic view of the three Gili islands, Lombok and Bali from the highest point on Gili Trawangan. The hill is located on the southern end of the island and is a superb place to watch a sunset or sunrise. You can surf fun, right-hander waves in front of Ko-Ko-Mo resort on the south west corner of the island. This spot breaks all year round. In the dry season there is always swell, the winds turn it on shore but tends to die down early mornings and late afternoons. In the wet season the winds are very low or off shore but the wait for swell can last a couple of days or more. The break, if a little fickle, is well worth checking out. People doubt this spot, which helps to keep the crowds down. Check the surf report for Gili Trawangan here. Stud Stables offers a unique opportunity to explore Gili Trawangan on horseback. Ride down picturesque paths and through shady coconut groves then along the beach. Learn how to make some famous Indonesian dishes by participating in a cooking class. The 3 hours class offers a unique opportunity to learn the secret of six tasty and delicious Indonesian dishes and Lombok specialties. Experienced teachers will guide you in English through a session of “completely hands-on” fun filled courses. One cooking station is shared by two and you will make and eat your own food. Contact Gili Cooking Classes for more information. All three islands have their own unique style and a day spent island hopping is a good way to discover the Gili islands of your dreams. Each island is within short distance of the other and the waters between the Gilis are usually calm. Charter a local boat for a day of exploring, or arrange a package tour around the Gili islands that includes snorkelling and lunch on a one of the other Gili islands. There is an island hopper boat commuting twice a day between Gili Air, Gili Meno & Gili Trawangan. And a public speed boat running every hour from Bangsal (Lombok) via Gili Air and Gili Meno to Gili Trawangan. The island hopper boat leaves Gili T at 9:30 am and 4 pm, stopping first at Gili Meno then at Gili Air.